There has been a big delay in blog posts on Big Yella, firstly we would like to say sorry, once the car was on the road, all we wanted to do was drive it and not sit in front of a keyboard, This blog post will take you through the wheel alignment and shakedown at Cootamundra Airport. We have the car entered in the 3rd round of the Nulon Nationals with is a 500M drag race down a big wide runway. With the deadline looming and final prep on the car taking longer than hoped for, the boys at Impossible Fabrications spent many long nights (that turned into Mornings) getting the Civic ready for the shakedown. it wasn’t just the running gear that we have to bolt up for the final time, Door trims, Carpet, Dash, Radio, Headlights etc all had to be re installed and in most cases modified to fit. The exhaust also became a bit problem, the old tunnel for the exhaust now had a custom 1 piece drive shaft taking up the room, we had to some how get from the dump to the back of the car without hitting the gearbox and not limiting our ground clearance too much. We are really going for the sleeper look, so standard seats, no body kit, standard paint, faded number plates all have their part to play. Once we get the car performing well enough, then we will start playing around with the way it looks. Being a street driven car we dont want to create too much attention. How we drive the car will have a big part to play. Only 12 hours before our event, and a 6 hour drive to the Airport, the car drove out of Impossible Fabrications under its own steam… For the first time in 5 weeks the civic was alive again. Grubbo did his own kind of shakedown on the back streets of Moorebank on route to good friend and Wheel aligner to the Stars, Ian Porter from Porter Performance. Ian was happy to do a wheel alignment on the car at close to midnight for us as he knew how much work had gone into this car, we cant thank him enough, Now the real question was, do we set this up as a Honda, as an S15 or as a custom alignment. We left it to Porter`s best judgement. Porter ended up getting it within 2% of an S15 wheel alignment which we were over the moon with, The wheel aligner doesn’t lie so any mistakes we made in building the car would show through the machine, It was spot on which was the best news we have ever heard. Off to coota we went, we had only driven the car for 15km on the road so far and hadn’t put it past around 70km, how straight the car was gave us confidence to give it the beans when the time was right, but first give the chassis a good shaking and see if anything comes loose. Well, we may have over done it… first thing we did rolling off the trailer was a 3rd gear burn out on a closed track which wasnt the best way to make friends (sorry again Hawko) almost getting kicked out of your own event before its even started would not be the best start to Big Yellas life. After some back room talks we were allowed to stay, with our heads firmly pulled in. 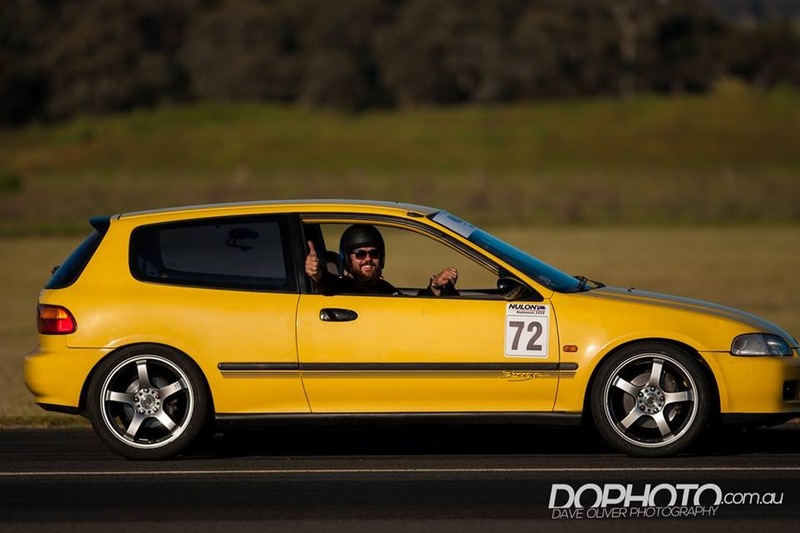 Next step was a couple of shows including world time attack and Summernats… After that it is focusing on having fun behind the wheel until we take on the 2015 Nulon Nationals. AS you can see, Big Yella is a massive hit with the ladies. For now he is just cruising the street looking to upset evo`s left right and center. We have some huge plans for this car so stay tuned and subscribe to be one of the first to see ” Stage 2″ – trust us when we say it will be worth it.